Apple is a mobile device company as Steve Jobs said it in one of his presentations. As a mobile device company, you might ask yourself, what is the next mobile device that Apple should come up with next? In this article, I present to you, the (fictional) new mobile device, the iProof camera. A rugged waterproof and shockproof 4K-capable camera designed for extreme photography. 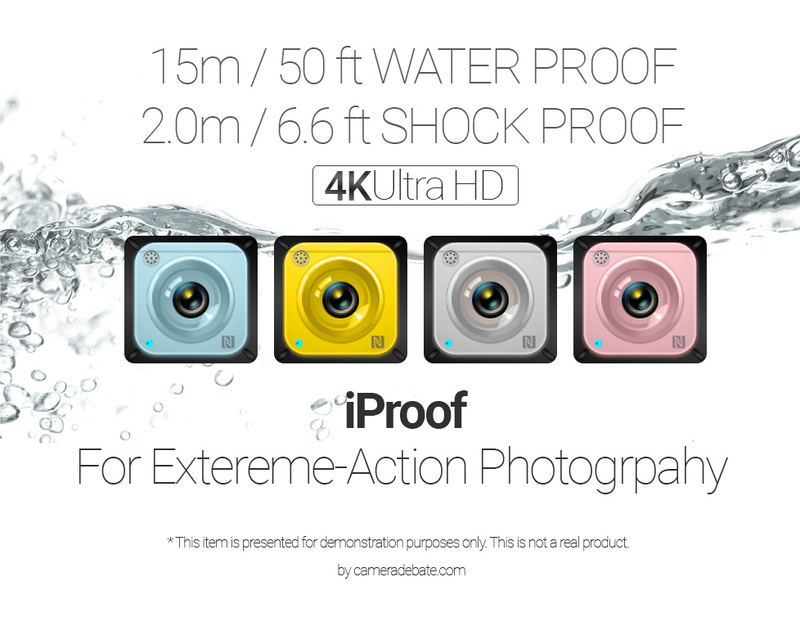 Disclaimer: the iProof camera as presented in this article is not a real product. It’s presented for demonstration purposes only. I think that now that Apple can really benefit from having this type of device in his mobile device lineup. It can appeal to the entry-level market, giving iPhone owners an accessory that will help them capture unique and create snaps and videos in any weather condition. It will be great for shooting extreme sports or for documentation movies. the iProof camera can record photos and videos directly to your iPhone device. If you are near the pool, put the iProof in your bag and take the iPRoof camera for an underwater swim. Attach it to your belt or helmet and document what happens around you. The iProof can record 4K Ultra HD videos and can even shoot in very dim lighting conditions due to its F1.7 aperture lens and Apple’s new 3-layer BSI sensor. This little cubic camera can withstand almost any weather condition. Shoot with it in the rain, capture videos underwater without and worries due to its mobile device industry leading IP69K rating, world’s first in a consumer camera. The iProof camera can be operated using Siri dedicated iProof commands, by touch, by rotating the camera to change settings and by physical buttons at the side and back of the camera. This is the ultimate companion accessory for your iPhone smartphone. It’s compatible with iPhone 5S, iPhone 6, iPhone 6 Plus, iPhone 6s and iPhone 6s Plus. Is this should be Apple’s new smart mobile device? Share your thoughts in the comments section below, don’t forget to share and thanks for reading. A reminder: the iProof camera as presented in this article is not a real product and not related to Apple company in any way. It’s presented for demonstration purposes only.